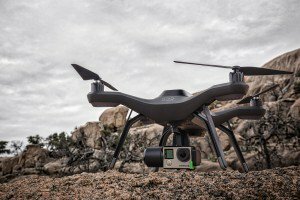 Solo, an all-in-one personal drone whose ease of use and powerful new features kick off a new aerial age. With computing power unmatched in the industry—from two integrated Linux computers, one on the craft and one in the controller—Solo delivers several world-first technologies, such as unfettered in-flight access to GoPro controls, including wireless HD streaming straight to mobile devices, and effortless computer-assisted Smart Shot flight features that allow even new pilots to capture professional aerial video from day one. 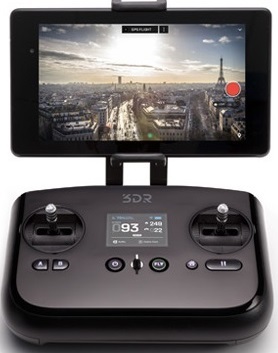 3DR Solo app for Android and iOS lets you control your GoPro, choose between a live view from the camera and satellite view of your selected shot and even change how the controller responds to commands. 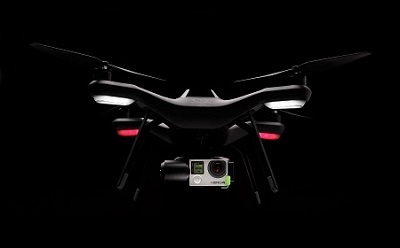 $1,400 with a GoPro-holding gimbal included.